Indeed, the good Rabbi concludes his fiery comments by exclaiming, “Shame!” and “praying that he can find forgiveness in (his) heart for the abusive message” of the Neturei Karta. He does offer those bearing this “appalling message” some hope. Despite their having “belittled our campus by their presence” he will “pray that they learn to love their fellow Jews even when they disagree with them.” Clearly in the person of the Columbia University Jewish chaplain “love” of one’s opponent has some strange means of articulation. Nonetheless, between the expressions of affection in the article, there are a few arguments offered as well, to which we now turn our attention. The Rabbi’s critique seems to revolve around four points. 1) The Neturei Karta claim to represent the “vast majority of Torah leaders” is false. 2) They distort the views of those Jewish leaders cited in their literature. 3) They are a very small group and “unique among the Jewish people world wide.” 4) They don’t care if Jews are killed. Let us examine each of these claims with dispassion. We will soon address the state of Torah opinion today. Clearly our reference was to the state of affairs at Zionism’s inception, around the turn of the last century. And, we challenge Rabbi Sheer to deny that those supporting Zionism, as represented by the early Mizrahi movement, were anything more than a tiny segment of observant Jewry. Further, we are quite sure that the Rabbi would also grant that the early Agudath Israel movement, which was composed of “vast majority of Torah leaders” was “passionate” in its opposition to Zionism. The good Rabbi apparently limited himself to reading the leaflets we handed out. Would he have read the booklets as well he would not have fallen prey to the distortions he offers of the position of Rabbi Samson Raphael Hirsch, the nineteenth century German leader. By focusing solely on Rav Hirsch’s depiction of the positive tasks and hopes of exile, Rabbi Sheer is able to posit, “We cannot presume that he would hold similar notions in our post-Holocaust era.” This notion is tenable only if one is aware of (or quoting) selective parts of Rav Hirsch’s teachings, those partaking of, what we may see in retrospect as, myopic hopes for Europe. His other quotes show that his opposition to Zionsim was first and foremost rooted in its violation of the intrinsic terms of Jewish exile. Assuredly those terms cannot change over the years. Rabbi Sheer admits that our reference to Rabbi Elchanan Wasserman, a world renowned Torah leader, as a staunch anti- Zionist is correct. In order to somehow get around this fact he tells us that Rabbi Wasserman’s son was his (Rabbi Sheer’s rebbe) and that the younger Wasserman would have been “appalled at the message and presence of Neturei Karta on my campus.” Of course, what Rabbi Simcha Wasserman has to do with the citation of his father’s views is never explained. By the time the Rabbi got to his second paragraph on the Wasserman matter he had become confused by his own distortion. He writes, “The reference by Neturei Karta to Rabbi Simcha Wasserman and other sages is presumptuous, deceptive or irrelevant.” Of course, we have never made reference to Rabbi Simcha Wasserman, rather to his father, who Rabbi Sheer admits was a staunch anti –Zionist. In addition, our booklets, which the good Rabbi refused to touch, offer extensive quotes with sources covering a diverse selection of early 20th century Torah leaders ranging from Brisk (mitmagdim) to Lubavitch (Chasidim), all vehement in their rejection of Zionism. As far as the size of Neturei Karta there is no way to posit a membership figure as there is no formal organizational structure anywhere in the world. Nonetheless, if Rabbi Sheer is claiming that Jews who oppose the very existence of the Jewish state are a minor, “unique” sect, this clearly speaks of some degree of ignorance of Jewish demographics in the Holy Land and around the world. 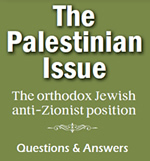 Among those groups in the forefront of anti - Zionism we find Satmar, with probably close to a seventy thousand followers across the globe, Toldos Aharon and Avroham Yitzchok with tens of thousands, all those who accept the halachic authority of the Beis Din Zedek of Jerusalem, the Kasho and Nitra movements and settlements here in America, the huge educational system of Torah V’Yirah in Meah Shearim in Jerusalem and various Brisker yeshivas throughout the Holy City. We may also add the Viznitz-Monsey Hasidic group, whose Rebbe is profoundly anti-Zionist and most Williamsburg based Hasidic groups in America. The list could go on and on. Thus, Rabbi Sheer’s claim that those opposing the state of Israel are smaller in number “than Jews affiliated with Columbia” certainly bodes well for on campus Jewish activities. Incidentally, it is worth noting, all the above mentioned anti-Zionist groups refuse to accept any moneys dispensed by the Israeli state. In addition to these overt anti-Zionists there is the Agudath Israel world movement which was also opposed (in most of its factions) to the establishment of an Israeli state. Post-1948 the Agudah leaders (as best expressed in Reb Reuven Grozosky’s Beyos HaZman) concluded that, given the state’s existence, it was best to work through it to further Torah interests. The segment of the Israeli population that favors this position is enormous. They have no use for the symbols of Zionism (the flag and national anthem are meaningless to them) and they strenuously avoid military service. In fact, what most distinguishes them from the anti-Zionists is that the latter refuse to benefit from the Israeli government, while the non-Zionists are quite content to accept the state’s largess. In our view this non-Zionist position has its moral inconsistencies. Nevertheless, it is clearly not a Zionist position and left to its own devices would never have produced a state of Israel. Hence, Rabbi Sheer’s claim, that opposition to Zionism is a fringe persuasion amongst observant Jews, is demonstrably in error. We suspect that Rabbi Sheer is well aware of all the above facts and can offer no explanation as to why he would wish to conceal them from his readers. Lastly, the good Rabbi claims that we “show no compassion for our fellow Jews.” We realize that he is referring to the recent violence, but before discussing that question, a few facts need be noted. The hundreds of thousands of anti and non-Zionist Jews in the Holy Land and around the world are well known for their extraordinary acts of chesed (kindness) towards all Jews. The scurrilous charge that Neturei Karta adherents are not given to “compassion for their fellow Jews” is laughable and damnable. Once again we think that the good Rabbi knew all this. He knows that the demonstrators at Columbia two weeks ago would be the first to assist any Jew in a time of need. What motivated his wild accusation of “no compassion”? Simply stated the Rabbi was irked by the fact that Neturei Karta chose to show sympathy for Palestinian dead. Of course, it is a tragedy when a Jew is killed. But, it is also a tragedy when any human being and especially children are killed. And it is particularly troubling when they have been killed by one’s own people. It is precisely at such a moment, that the situation demands the people of the Torah step in and proclaim to the world that this is not the work of Jews imbued with the spirit of our faith. Rabbi Sheer, it is very easy to offer support for yet another pro-Israel demonstration. On the other hand it requires real moral courage to stand with those who have been wronged by your own people. That, we suggest is true kiddush Hashem (sanctification of G-d’s name). There is a time and a place to offer sympathy for one’s own. Two weeks past was the time to seize the moment to offer kindness to the Other. We are disappointed that you did not wish to join us! We are as traumatized as the good Rabbi by the recent scenes of brutality emanating from Ramallah late last week. The burning of synagogues on the West Bank is condemnable by all men of good will, Jewish and Palestinian. But none of this relates to the question of whether Jews should participate in a vigil for Palestinians or whether it is somehow evil to condemn brutality on the part of the Israeli government. Rabbi Scheer was angered by our proclamations of universal morality, yet, at root there is a more basic issue between us. It concerns the nature of Jewish exile and redemption. The Rabbi further asserts “while Jews have been praying for return to the land of Israel since the Roman conquest, world conditions for such a return always made it impossible to implement.” Here we arrive finally at the crux of the matter. Was it “world conditions” which Jews for over two thousand years saw as preventing their return or was it a lack of Divine intervention? Where does Rabbi Scheer find in the vast literature of exilic Jewry, including hundreds of selichos prayers (where exile as punishment is a frequent theme) any attribution of exile to “world conditions”? Surely, what Rabbi Scheer has fallen prey to is the emotional transformation of the traditional Jewish understanding of exile into a secular belief in geopolitics and material power.